The Hi-Lo (also known as High/Low) card counting system reckons as a basic technique that aid you to memorize the traces of cards dealt. According to card counting systems mechanism the player should watch and keep it mind the cards of other players and the dealer cards as well. It provides him or her with a helpful knowledge - the understanding of what cards are still there in the shoe. Thus the player may vary his bet wages accordingly. The Hi-Lo card counting system was created by Harvey Dubner and considered as a perfect system for amateurs and intermediate blackjack players to start with. Without a doubt this is a simplest card counting system for beginner to learn and use. 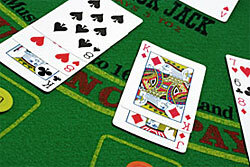 Due to Hi-Lo positive characteristics this technique is considered as the most popular among the blackjack game players. It's better to start with card value chart at once and then pass on to explanations. As we see in the chart given below there are 3 basic groups of cards according to their value and count as a result. In Hi-Lo card counting system we observe five small cards value 2, 3, 4, 5 and 6 and counted as +1 while playing. This type cards sum is 20 in whole. Also we see 7, 8 and 9 which a taken as a middle cards (12 in the deck). They are considered as neutral and don't influence the count total. The 20 big cards (10, J, Q, K, A) are counted as -1 while playing. It must be mentioned that the Hi-Lo system is a balanced one. That means when you end to count all the 52-card deck you get 0 as a final counting point. For better understanding how the system actually works we offer you to observe the following imitating example. Imagine 3 players and 1 dealer at the playing table. The dealer keeps in mind the blackjack rules and thus distributes 2 cards for each player and one face-up card for himself. E.g. Mr. Wise has 4 + Jack, Mr. White has King + 7, Mr. Black has 10 + 2 and the dealer has Queen as a hole card. This is the first round of the game and thus Mr. Wise starts to count with 0 and begin with his own cards. He adds 1 to initial 0, then minuses 1 (4 + Jack). After that he minuses 1 and adds nothing (King + 7) and again minuses 1 and this time adds 1. The player initial hands total gives Mr. Wise -1 count to which he minuses another 1 as the dealer has Queen. As a result for this very moment of the game the count is -2. Mr. Wise keeps it in mind and proceeds with his playing and counting.